We didn't do so well on this one, you guys. There was actually a tie for Best New Business in '95, as well as an "overwhelming number of candidates," an indication of the area's booming economy, the Inlander blurb proclaimed. Today, neither of the businesses that stood on the top of the pile are actually still doing business. The Birkebeiner Brew Pub is gone from what is now the Community Building on Main Avenue. 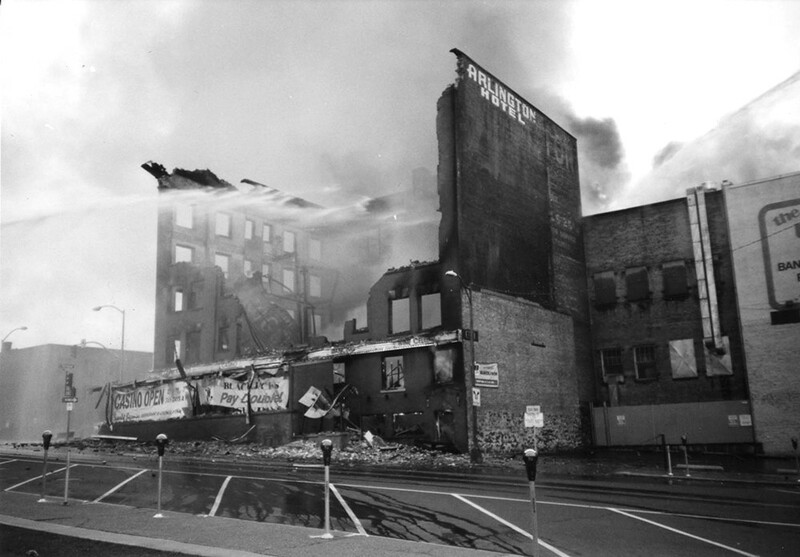 And the Mars Hotel literally crumbled in a blazing inferno that damaged surrounding apartment buildings, displaced more than 100 downtown residents and nearly took out an entire city block. Infamous casino gaming developer Robert Saucier purchased the historic Arlington Hotel in 1992 and renamed it the Mars Hotel after a Grateful Dead album. By 1997, he filed for Chapter 11 bankruptcy in order to keep the doors open while dealing with $3.2 million in debt, according to news reports at the time. In November of 1998, a bankruptcy judge shuttered the hotel and casino and ordered the company to liquidate all its assets. The building burst into flames just after 5 am on July 16, 1999, after Saucier had already skipped town to Las Vegas. With the help of a gasoline-sniffing black Labrador named Dolph, investigators quickly determined the fire had been set deliberately, though it does not appear anyone was ever held responsible. Reached by phone recently, Saucier denied any involvement in the arson. "People can speculate whatever they want, but I was removed as being a suspect because I lost a lot of investment in that building," he says. "I was a victim. The building was uninsured, so why would you burn your own building if it was uninsured?" Saucier is still listed as the executive vice president and chief product officer for Galaxy Gaming, a company he founded based in Las Vegas. Since hightailing it out of Spokane, the elusive businessman's career has been marred in controversy. Saucier was denied a gaming license in Oregon following a state police investigation. An administrative judge in California declared him unfit to do business anywhere in the state, citing dishonesty about where he went to school, his criminal record and outstanding lawsuits. Saucier was recently ousted as CEO of his own company after a "train wreck" application almost cost Galaxy Gaming its license to operate in Nevada.